There's no reason to believe President Hosni Mubarak's family has fled Egypt's rising, deadly political protests, sources in Cairo tell CBS News. Rumors had been flying based on a report by the U.S.-based Arabic website Akhbar al-Arab that the Mubaraks had become scared by the Egyptian protests seeking to oust the president in much the same way Tunisian protestors succeeded in doing recently. Akhbar al-Arab and other sources had been saying that both Gamal Mubarak, the president's son and possible successor, and President Hosni Mubarak's wife had fled Cairo for London. However a source told CBS News that there is no reason to believe that this is true. Gamal was educated in London and travels a lot, but the U.S. has no reason to believe that the family has fled. Egyptian anti-government activists tried to stage a second day of protests around Cairo Wednesday in defiance of an official ban on any gatherings, but police quickly moved in and used tear gas and beatings to disperse the demonstrators. The Interior Ministry warned police would not tolerate any gatherings, and there was a heavy security presence on the streets, poised to crack down quickly on any new signs of unrest. 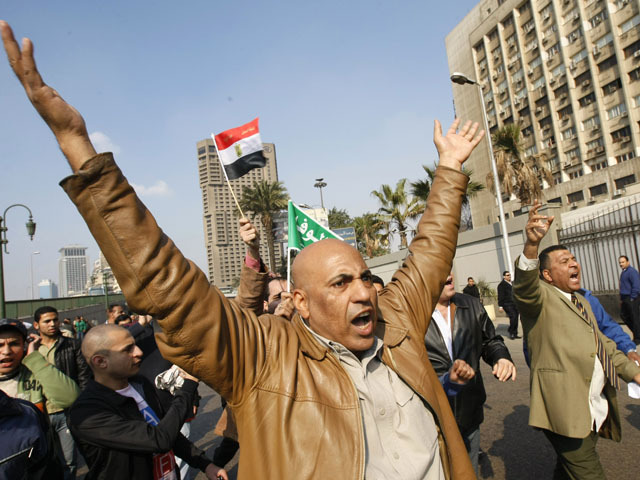 At least three people have been killed and scores arrested in the protests in Egypt thus far.